The 21st century has produced some dazzling architecture – but none more enchanting than the world of ice sculpture. New buildings made entirely out of ice are popping up all over the world. We’ve put together a list of the ten most amazing architectural works made of ice. The Ice Hotel is exactly what its name states – a hotel made entirely of ice. 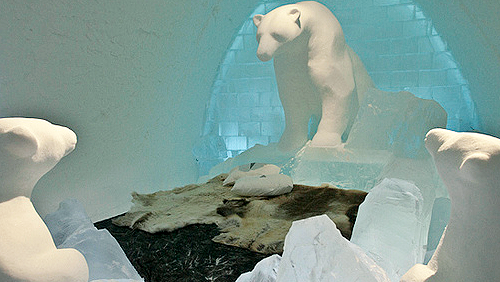 Dating back to 1990, the Ice Hotel is the first of its kind. The hotel offers 85 beds covered in deer furs, and is made with 15,000 tonnes of ice. Eventually, the ice melts away, forcing the hotel to close down for the warmer months, but it is rebuilt every January with a completely different design. The Ice Palace in St Paul, Minnesota is absolutely breathtaking. Featured as part of the Midwestern state’s Winter Carnival, the incredible building was originally built after locals took offence to comments made by a New York journalist who described the city as “another Siberia, unfit for human habitation”. 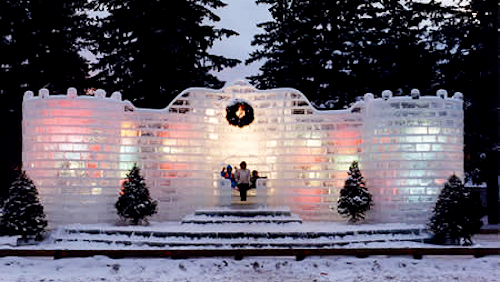 Another Midwestern town annually constructs their own Ice Palace – this one with a tradition that dates as far back as the 1920s. Each year, volunteers from Wisconsin team together in about 700 man hours to build the Eagle River Ice Palace for the community and visitors to enjoy throughout the winter months. Canada is another country that appears to have taken a strong liking to the concept of ice architecture, featuring not one but two incredible buildings made entirely out of ice. Both located in Quebec, the buildings featured as part of the annual Winter Carnival hardly appear to be made out of ice at all. 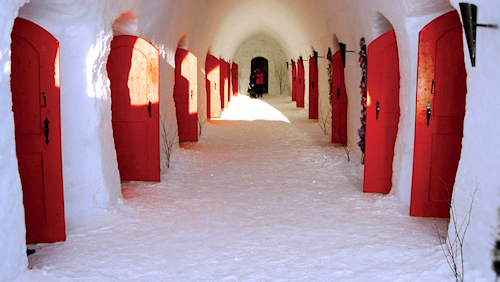 Also located in Quebec is the enchanting Hôtel de Glace – the only ice hotel in Northern America, and as far as we know, the only one that features a chapel, a bar and a slide! The hotel is made from 15,000 tons of snow and 500 tons of ice and has 36 rooms which host approximately 140,000 guests each year. Located in Sorrisniva, by the banks of the Alta River in Norway, the Igloo Hotel is exactly as its name suggests. Another hotel built entirely of ice. Even the glasses used in the hotel bar are made of ice! Usually open between the months of January and August, you can even have your wedding in this incredible building. Over in Finland, the Lainio Snow Village is open between December and April and features a restaurant, a bar, lobbies, hotel rooms and suites as well as outdoor buildings such as walls, slides and sculptures, made with beautiful design work and constructed purely of ice. It even has a disco! Also in Finland is the LumiLinna Snowcastle, located in Lapland. Another outstanding piece of ice made architecture, the LumiLinna Snowcastle is rebuilt each year, with its origins dating back to 1996 when the first of its kind was constructed. With its 1100 metre long walls, the Snowcastle made the Guinness Record Book with the longest snow-walls ever. China is another country that has a strong appreciation for the work of ice architecture. It is home to another two ice buildings. The city of Harbin, located in the northeast of China, features its own International Ice and Snow Sculpture Festival. Each year there is usually an array of incredible ice architectural works on display for visitors to enjoy. Yanqing County in Beijing features its own winter festival – the Yanqing Ice Festival – a tradition that finishes off the Lunar New Year celebrations each February. Like the Harbin Ice and Snow Sculpture Festival, Yanqing’s festival features a stunning assortment of different ice buildings, and is often illuminated with coloured lights that only add to the enchantment. Top 5 Open House Melbourne Picks Ferris Bueller House Slashes Asking Price Bieber Dummy Spit: Jackson Mansion The Most Bizarre Homes in the World Who’s Going to Win The Block Sky High?